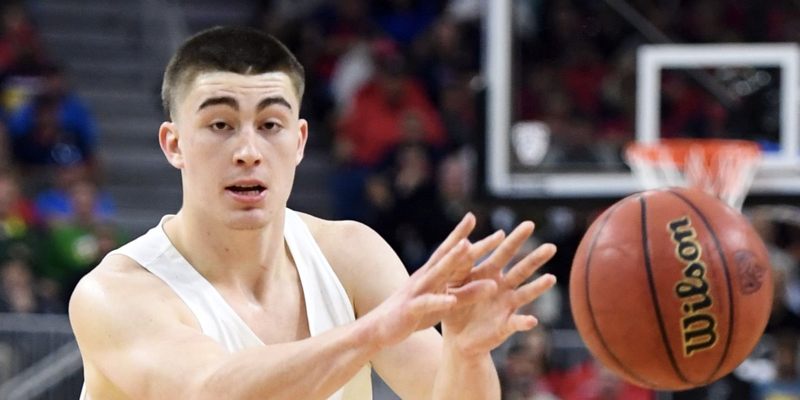 Despite a college career marked by ups and downs, guard Payton Pritchard has cemented himself as not only an extremely effective skill player on offense, but also as a great team leader for the Ducks. Pritchard, currently a junior with the Ducks, is the perfect example of a player who has the ability to lead by example. Throughout his career, he’s been known to match talent with work ethic on both sides of the ball. Being a veteran player now, this attitude towards work ethic makes him a clear leader on the team. Accompanied by his priceless and unquestionable leadership ability, Pritchard possesses a well-rounded offensive game. During the 2016-17 season, Pritchard’s freshman year, it was clear that, though he was a player with a very wide skill set, he would need a little more time to develop. The rookie scored an average of just over 7 points per game, with a field goal percentage of 39.3% and 3.6 assists per game. By his sophomore year, he’d transformed into a crucial player for the Oregon offense, reaching a career-high stat line of 14.5 points per game, a field goal percentage of 44.7% and 4.8 assists per game. 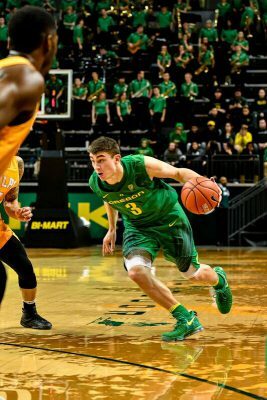 The 2017-18 season showcased tremendous growth for Pritchard, and he took advantage of the opportunity to play more minutes and become a key player on the Oregon squad. During the 2018-19 season, the guard produced a solid stat line, maintaining a 42.3% field goal percentage, scoring 13 points per game and spreading the ball around for 4.6 assists per game. He led a team that faced tons of adversity this season. But through a plethora of ups and downs, the Ducks ended up winning when it truly mattered. There is no question that Pritchard had much to do with their unforeseen success at the end of the season. Pritchard went on to win the Pac-12’s Most Outstanding Player Award after leading the Ducks to victories against the No. 3, No. 2 and No. 1 teams in the conference and, ultimately, the conference title. When it came to the award, there was no question that Pritchard deserved it more than any other player, tallying 20 points in the conference championship game. In all four Pac-12 Tournament games, Pritchard only committed 4 turnovers through 138 minutes of play and averaged 16.25 points per game. Every bit as remarkable as his skill set is Pritchard’s passion for the game and ability to lead his team when they need it most. The seasoned veteran has stepped up into a leadership role this season, and it has become clear that he is a difference-maker for the Ducks. The Ducks, under the strong leadership of players like Pritchard, finished the season on an extremely strong note, going into the NCAA Tournament as a 12-seed and making it all the way to the Sweet 16. After the Ducks’ season came to a final halt at the hands of Virginia, the question is: What will senior year hold for Pritchard?